When I was serving on the ASTD Technowledge planning committee I had the pleasure of working with Jonathan Halls. Jonathan and I went for coffee after the final planning committee meeting. We shared ideas as well as our passion for video, it was a one of those great conversations. Jonathan knows his stuff, he was a learning executive at the BBC, where he ran the prestigious production training department. Jonathan has also taught media and learning for almost 20 years. He is currently an adjunct professor at George Washington University. I was flattered when Johnathon asked if he could interview me for the book he was writing. Of-course I agreed. As you would expect for a professional like Jonathon, the interview was a lot of fun and he brought out my best. A few months went by and then I received a package form Johnathan in the mail, it was the book and a nice hand written note of thank you. I was excited to dig in and read the book. Right away I could see that Johnathon had put something together that would really be valuable for anyone interested in starting a great video program for their organization. Jonathan has great attention to detail and it shows in this book. There are so many little nuggets in this book. I like the way he explains things so that anyone can understand. The book is laid out nicely and includes photos and illustrations to demonstrate some important techniques. As an added value you can access videos to support some of the key points in the book. 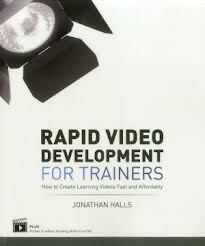 I would highly recommend this book to anyone interested in video. Not only should you read it end to end but keep it close by to use it as a reference. The book is published by ASTD Press and is available here.